What Does A Declining Dollar Mean? 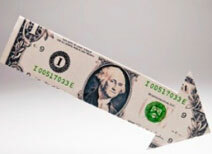 HomeBusinessWhat Does A Declining Dollar Mean? 1. What are the implications of a weaker dollar? – given the greater perceived risk, investors will demand a higher rate of return. In other words, interest rates will head up (and are currently, especially longer maturities). – significant exit of foreign capital from our market. Can you imagine the conversations going on around the world, but especially in China and Japan the two largest foreign holders of our debt? – as our economy is forced to pay higher rates to attract capital, the economy slows as the cost of debt service increases. – in a perverse way, I think our political leaders actually want a somewhat weaker dollar. Why? – A weakened dollar will help domestic production of goods relative to our continued reliance on imports. – generating some inflation is a de facto means of devaluing our outstandng massive amount of debt. Whomever is in debt currently can actually pay back those debts in future dollars that are worth less. – however, having the dollar decline in value marginally is akin to getting a little bit pregnant. 4. How do you stem the decline in the value of the dollar? – increase short term interest rates, that is, the Federal Funds Rate (currently sitting at 0-.25%) will have to go higher. What does that mean? Higher rates lead to a slowing economy. Although given the current economic turmoil, the Fed may have to increase the Fed Funds rate even sooner than they desire and we could suffer through a nasty bout of STAGFLATION. Playing with the valuation of the currency and not defending it is a VERY dangerous game.